Bus from Malacca to Batu Pahat is the most reliable and convenient mode of transport to travel between the two cities. Because there is no train station and airport in Malacca and Batu Pahat, bus becomes the only public transportation to travel from Malacca to Batu Pahat. S&S International Express is the only bus company provides daily bus service from Malacca to Batu Pahat. S&S International provides 2 daily departures at 11.00am and 5.20pm. S&S International Express is one of the popular express bus company in Johor offering wide range of bus service between cities in Johor State. The average travelling time from Malacca to Batu Pahat is about 3 hours depending on the road traffic conditions. One stopover will be provided during the journey. Passengers could go for washroom break or take a quick bite during a stopover. The bus fare from Malacca to Batu Pahat is costing at RM 10.90 for adult and RM 8.20 for child. This bus fare is for the VIP coach with more spacious seating. Passengers would be more comfortable with spacious seat during the 3 hours journey. The pick-up point in Malacca is located at Melaka Sentral Bus Terminal. Passengers could easily to go from Melaka town area to Melaka Sentral Bus Terminal via public bus or taxi. The arrival point is at the Batu Pahat Bus Terminal. 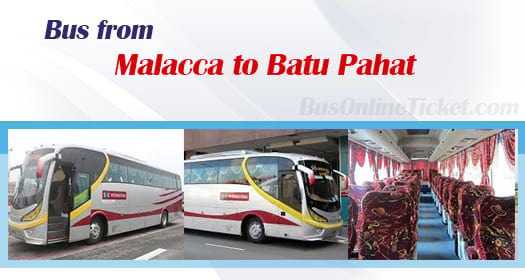 Booking your bus ticket from Malacca to Batu Pahat online at BusOnlineTicket.com has never been easier. You can earn BOT Miles when making any booking in BusOnlineTicket.com. We accept hassle-free payment method such as credit cards, Paypal, internet banking, Alipay and many more.